As we've discussed before, the kit is probably a bit over-priced; but to be honest, after looking up the individual components, I don't think it is too far out of line. A person could cobble something together for much, much less, to be sure, but I like the convenience and the inspiration that comes from following FarmSteady as they try different things. My previous sauerkraut project turned out really well - even better after some time in the refrigerator - so I figured I would try something new. The kit, of course, can be used to ferment many, many things, so it was a natural step to take; in fact, I suspect that FarmSteady is phasing out the "Kraut Kit" in favour of an identical kit packaged as a "Fermented Vegetable Kit:"
So simple that even I could manage it...almost. I did end up having a couple of minor glitches...more about that, later. The kit ferments 2 quarts of whatever you want to ferment, so I bought 5 cucumbers for the project, which ended up being really close to the right amount. Everything else that I needed, I already had at home: kosher salt, beautiful, fresh, locally-grown garlic, dried red chile peppers, bay leaves, mustard seed....I didn't have any fresh dill, but I did have dried dill weed, and dill seed, if needed. This thing is pretty handy, actually; with the "whirly-bird" blade, I had previously reduced a head of cauliflower to rice in about 15 seconds. This was the first time that I used the slicer attachment; because I was distracted by something else happening at the moment, I neglected to use the hand guard...and paid the price with a very nasty cut to my pinky finger. Let my mistake be a lesson: ALWAYS USE THE HAND GUARD! Five cucumbers seemed like just enough, if anyone is keeping track. Strictly following the instructions, I probably should have done this before prepping the cucumbers and garlic, but I am sure that it will be fine. The instructions didn't specify whether the water should be chlorinated or not; we have a spring south of town, and I could have gotten some water there, but ultimately chose not to. I did have half a litre of spring water on hand, so roughly half of this water was mildly chlorinated. I'm sure it will be fine, but I hope that I don't regret that decision. Intermittently, I added some of my garlic, a bay leaf, a broken-up chile pepper and a teaspoon of mustard seeds now and then. Coincidentally, this was right when I reached the top of the jar. Did you notice something missing? I forgot the dill. In fact, I didn't even think about it, until this morning! I'll add some tonight, when I get home from work; we need to stop by the grocery on the way home, so I will even by some fresh dill. 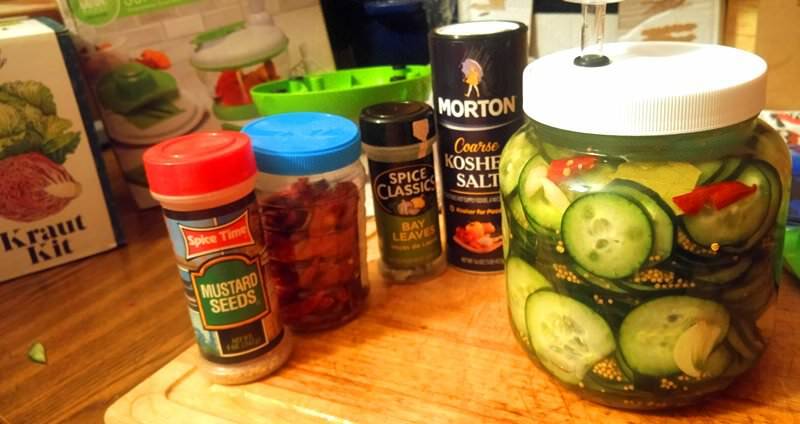 I'm not sure how much would be best to add, as it is a different type of dill than I normally use for my pickles; however, I'll probably be fairly conservative with it for this first attempt. I'll also be sure to add a few dill seeds, which seem to balance the dill weed a bit. I put the jar on the top shelf of our bedroom closet, which is currently almost a "normal" and "steady" room temperature, in spite of the winter months in north-central Montana. I'll check it in a week or so, but I suspect that it will be at least two weeks before the pickles are ready - possibly three. I am expecting some pretty good things to result from this, but we shall see how it goes. If anyone has any feedback, questions or anything else to add, please feel free to chime in. 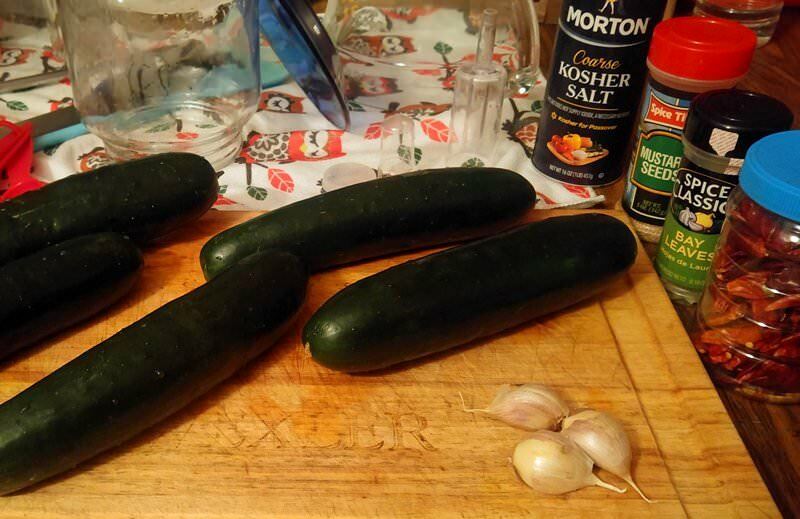 These cucumbers are store-bought, unfortunately - here in subzero (Siberia) Montana, it's the only option, right now. 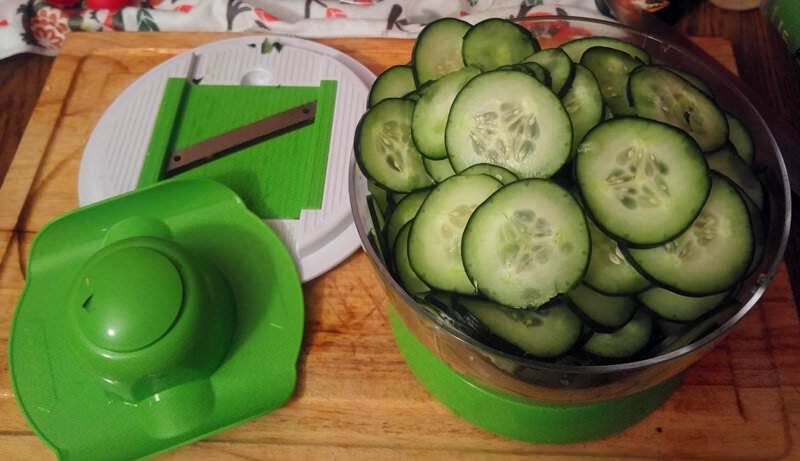 I normally use fresh cucumbers and get good results out of them with a salt/vinegar brine; I'm not too fond of the little "gherkin" types, but the "salad" cucumbers are generally good enough for me, with minimum processing (about 5 minutes in a boiling water bath). These cucumbers did have some sort of waxy coating on them; I tried to gently brush most of it off - we'll see if I was successful. I've got a package of seeds for Ukrainian cucumbers, and am looking forward to growing some this year for use with this method. As for the water - I should have bitten the bullet and gotten some spring water. I'm hoping that the fact that it is diluted by half will help. Anyway, because of those factors, I do expect these pickles to be "not crisp" - I'm hoping that they aren't full-on mush, but we'll see. Oak leaves can be a huge help in this regard. I've also heard that grape leaves work well, and cherry leaves are used in Romania. Unfortunately, none of these grow here. 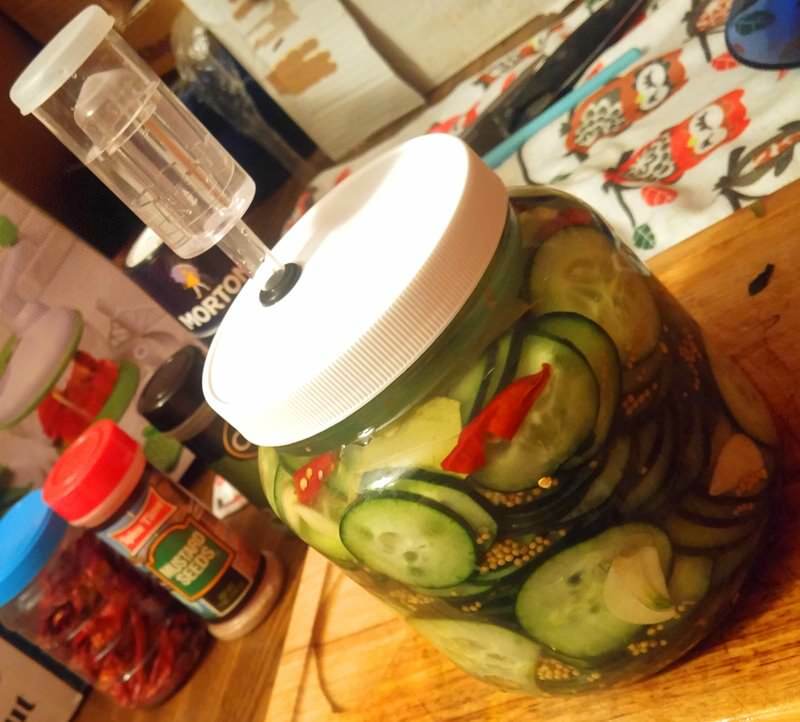 When I added the dill the next day, there was definitely some fermentation starting; the airlock was working, albeit very slowly, and you could sense that the cucumbers were beginning their transformation. I went pretty conservatively with the dill because I wasn't able to stop and get some fresh stuff. I ended up using dried dill weed and some dill seeds. 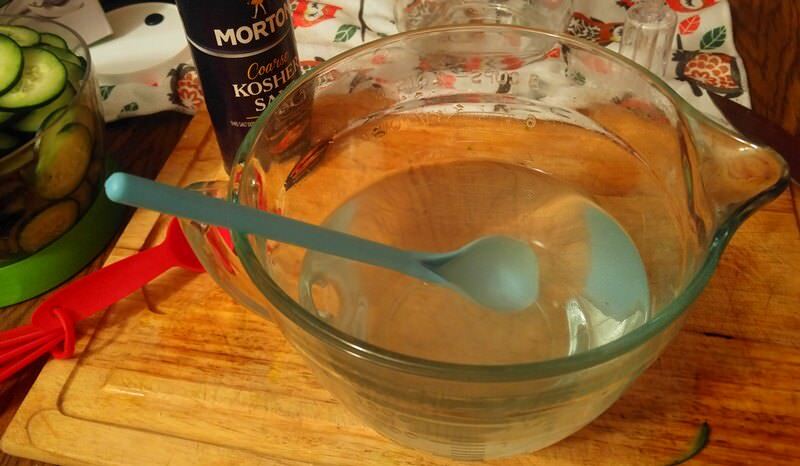 It tends to be pretty strong stuff, so I tried a couple of teaspoons, for now. I'm guessing I can add a little more later on, if need be. Consider the reusable equipment it contains; your first batch of kraut would have cost $35 (plus the price of the cabbage). 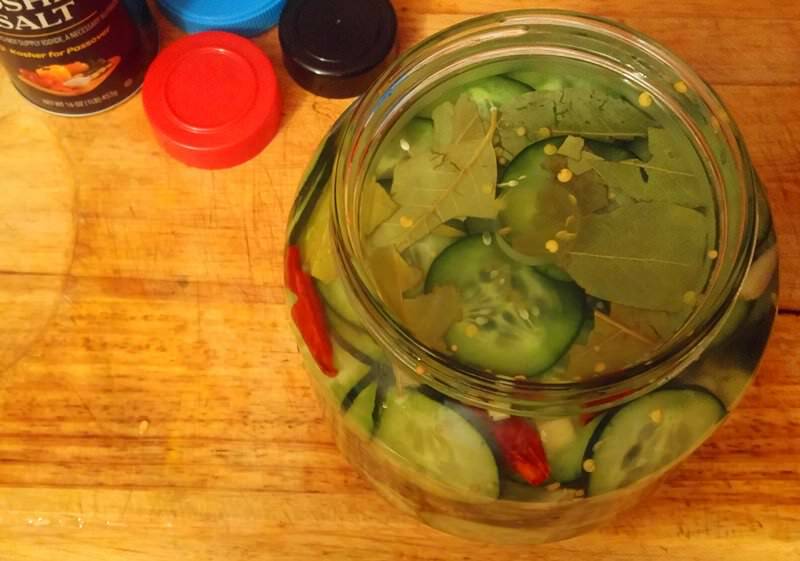 When you finish this batch of pickles, the cost will be $17.50 per batch. And so forth, as you amortize the cost of the kit. 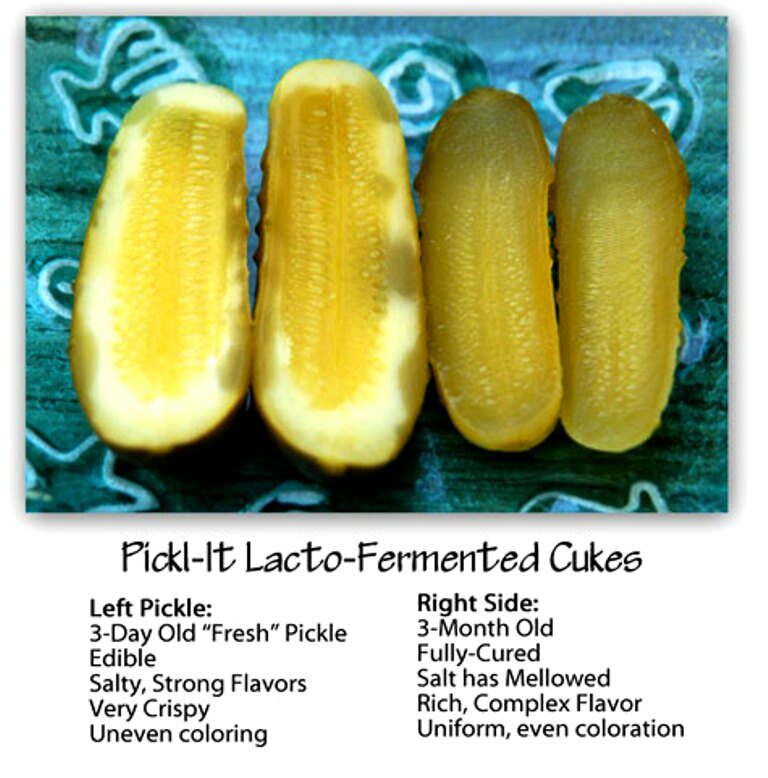 I'm really looking forward to experimenting more with this lacto-fermentation project, so that I can learn to gauge the timeline, method etc. 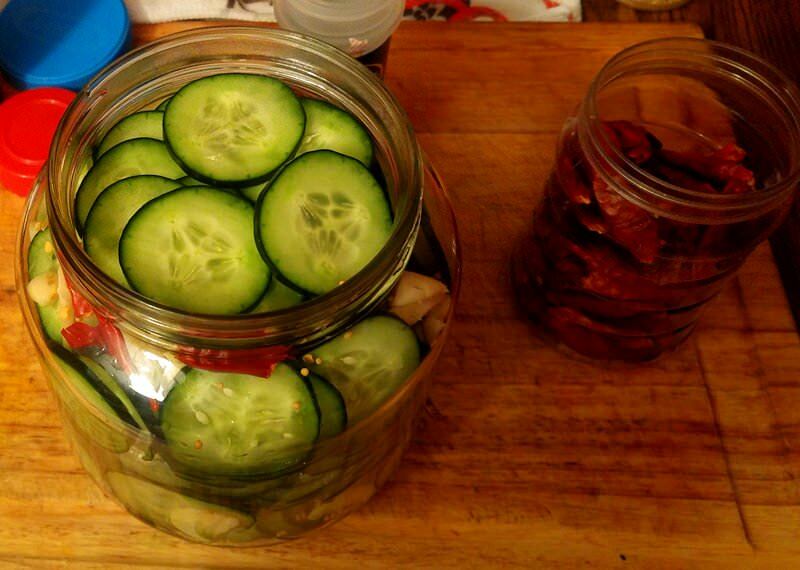 ; and, If I'm lucky, I'll get some decent enough pickle chips out of it to snack on or use with meals. I'm curious, is the fermentation lock the same one would use in wine-making? On a slightly different tack, I've been making kimchee again. I have pared the recipe down to essential ingredients as I don't seem to have a taste for the fish sauce and ginger and other such exotic ingredients. I just use Napa cabbage, salt, carrots and some Korean pepper sauce. Gochugang, I think it's called. I just leave the lid a little loose so as not to have any explosions and set the jar in a soup plate so any spillover is contained. 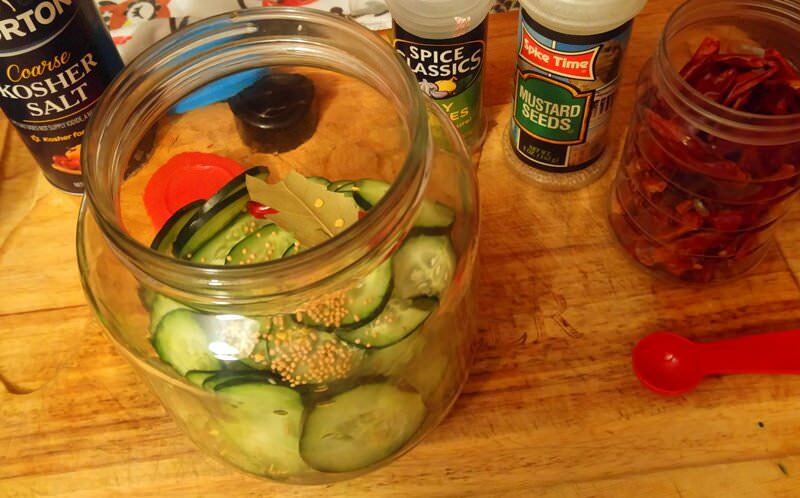 Have always done my open-crock pickles the same way. 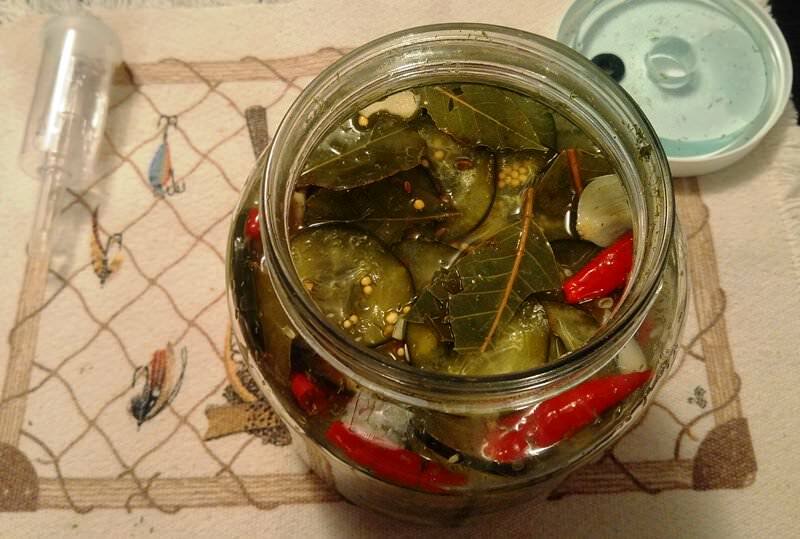 I think I've posted my grandpa's "stink pickle" recipe here. It too calls for grape leaves and cherry leaves. Never heard of using Oak leaves though. Yep - exactly the same airlock. The recipe isn't there, so if you do find it, please feel free to post it! It was a busy weekend, but I did get to sample a couple of these pickles and found them to be very good. The "pickled" flavor was right on point, with good garlic presence and a bit of heat from the peppers, but not too much. The dill itself seemed to be just about right, too. As far as texture, the pickles were much, much less mushy than I expected. They had a bit of crunch to them and were about the same as what I expect from home-canned pickles made with "regular" cucumbers and processed in a hot water bath. Not crunchy, by any means, but not mushy, either, at all. I let them ride through the weekend and will probably put them in pint-sized jars tonight, then into the refrigerator. 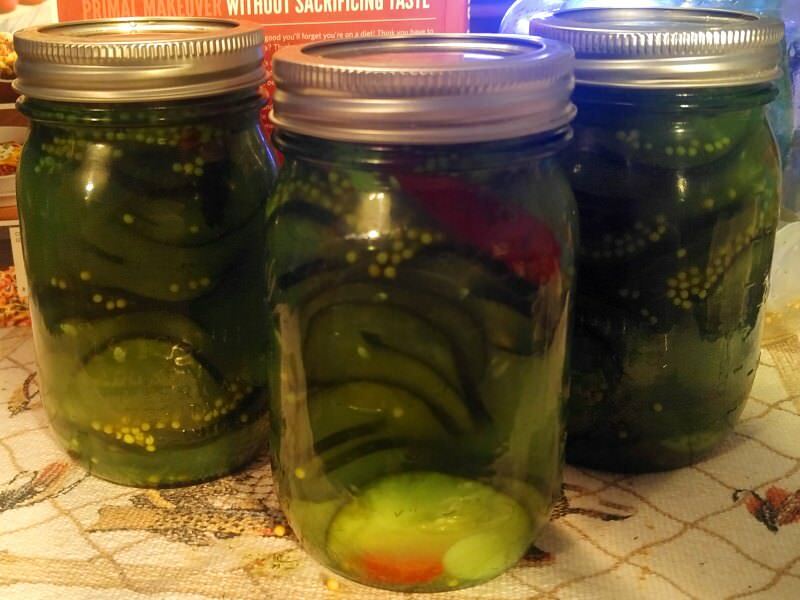 After 12 days of fermenting, I checked on my pickles Tuesday night, 6 February. The temperatures can be a bit cooler in our house, so I figured that the extra time (compared to 5 - 7 days recommended) wouldn't hurt. The pickles looked to be on schedule, as much as I can tell with my limited experience; it seemed to me that the initial fermentation was complete. and they tasted good. The flavours were all present, with strong garlic and subtle dill that made itself known without taking over. The "crunchiness" was far better than I expected, but by no means awesome. 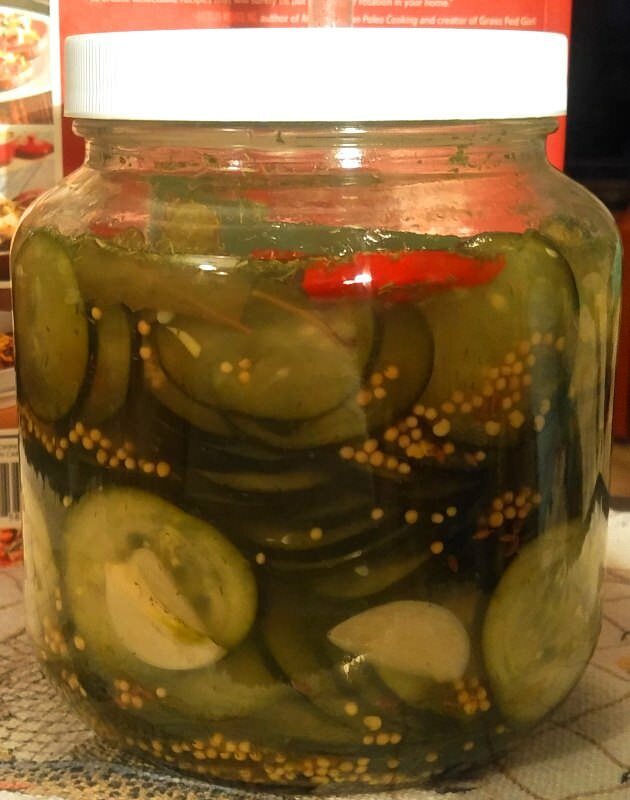 They were, however, quite acceptable in my opinion; no worse than any other home-made pickles, with a much better and more authentic flavor than store-bought pickles. I put the pickles into jars and into the back of the refrigerator; I'll check them again in a few weeks, and see what I end up with. I suspect that the flavours will develop and deepen, and that I'll be pretty happy with the results. Stumbled across the stink pickle recipe tonight. Posted it under the Hungarian sun pickle thread. Is it possible that the post didn't "stick?" They remain quite good, and in fact have improved as they "mature" in the refrigerator. 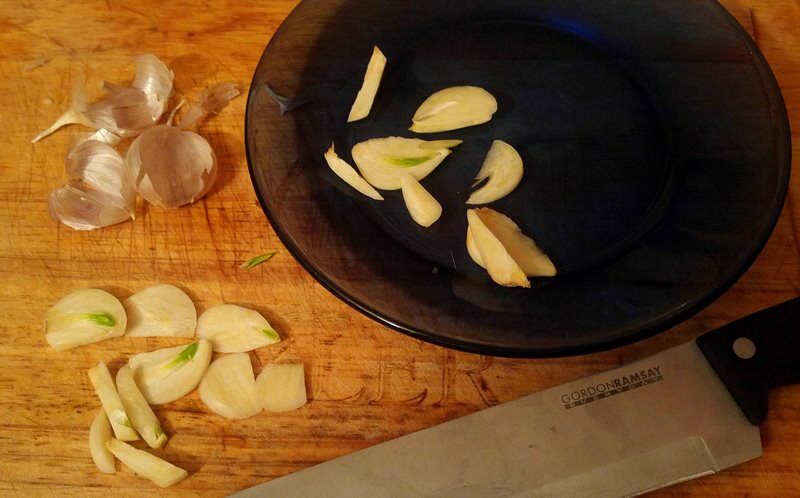 The lacto-fermented flavor is predominate, along with the garlic; in fact, I've decided I probably used a little too much garlic, which is a thing I never thought I would say. The pickles have a real "raw" garlic aspect to them that isn't bad, but it does take over a little. It seems as though I could have used a bit more salt, and definitely would have benefitted from more dill. I'll keep better track of this, next time. The pickles remain pretty darn crisp and "crunchy" - I've decided that there are no worries in that department. I'll make these again, either in chips again or as spears - or something. I'm not a fan of the tiny "gherkin" cucumbers, but in all honesty they might be perfect for this. Whatever cucumbers I use, I'll incorporate the tweaks mentioned above, and see what I end up with. In the meantime, this is worth trying, for sure - if you are on the fence about giving it a go, my suggestion is to just jump right in. I'll post it again in its own thread. I have edited the post to reflect this, but wanted to call attention to the error. Another note - Last night, I did add a (generous) pinch of kosher salt to the jar of pickles I was sampling, and this, to me, brought everything together really well, with almost just the right balance that I had been expecting from the beginning. The garlic seemed to be put in its place, and while it was still lacking the amount of dill I would prefer, the "brine" and the pickles themselves were absolutely scrumptious.